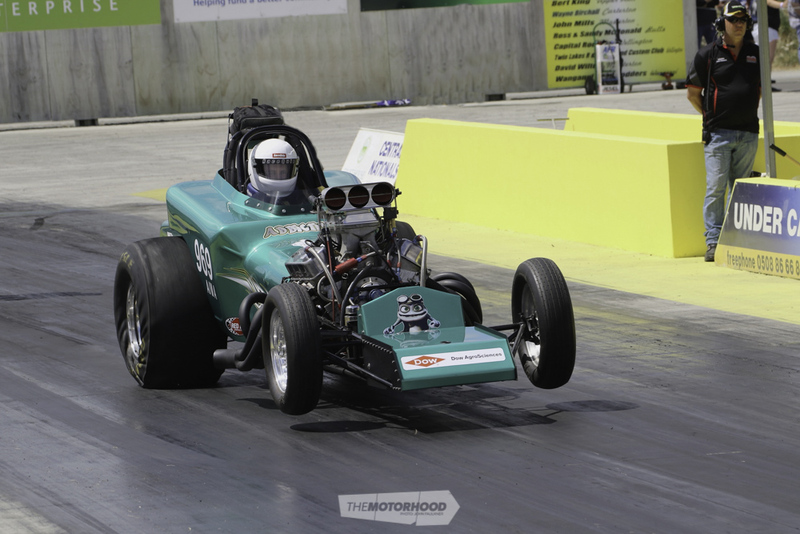 The NZDRA Central Nationals, held at Masterton Motorplex over December 9–10, represented a jump straight into the deep end of the 2017–18 season. 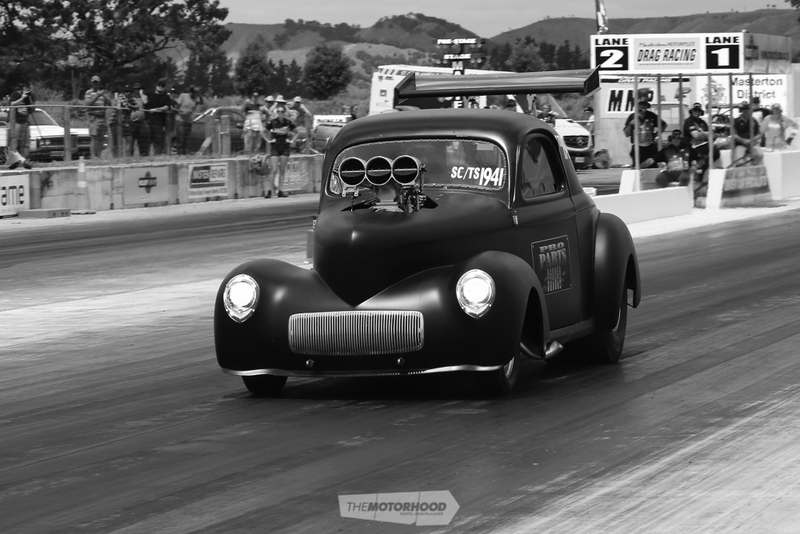 With 172 cars entered and clear skies above Masterton, a solid event was on the cards, and that’s what was delivered. In addition, Bob Wilton had advised a $5000 cash reward to any door car that managed to crack a five-second pass, and although the competition wasn’t heavy — with just Barry Plumpton, Nigel Dixon, and the Dobson boys shooting it out — a five was a pretty big ask. Nigel Dixon qualified first, with a 6.32s at 226.83mph, followed by Barry Plumpton’s nitrous-snorting mountain-motored Camaro which ran a 6.46s at 214.04mph. Trailing behind were Prestney and Dobson, still trying to sort out the Pontiac Grand Am’s new combo and running an 8.65s at 179.55mph. Unfortunately, nobody would be claiming the prize this time, and the qualifying times represented the best for this bunch. Top Alcohol had six cars entered, with the number one qualifier being Bert King with a 6.07s at 223.37mph, followed by Dwane Garrett’s 6.78s at 133.14mph. Simon Fowke’s ’57 Chev funny car, all the way from down south, claimed a 7.12s at 200.01mph. Unfortunately for the Garrett car, a collapsed front supercharger bearing blew the burst panel out, causing a fair bit of body damage. The Top Alcohol finals came down to Paul Davison against Bert King — a great race, with both in the low six-second zone, and Bert King taking it out through his 6.19s at 220.64mph against 6.37s at 221.23mph. Dave Gauld qualified with a 7.19s at 187mph. He’s obviously got the wild antics calmed down, as the car was running pretty straight. Super Sedan once again had a large field, and the number one qualifier once again was Blue Thunder Racing — long, hard burnouts, and nice, straight runs with a best of 7.80 at 172.48mph. Brent Whittingham sat behind him in his nitrous-snorting Camaro, getting ever so close to that magic seven with a best of 8.08s at 165.36mph. Though he never quite got a seven, he did end up taking the win in the large Super Sedan field. Rex Duckett was getting a bit outta control in this burnout, although a best of 7.55 at 182.22mph was certainly on the money! He ended up taking out the Super Stock class, with a 7.60s at 182.15mph. Eight competed in Supercharged Outlaws, including Kendall Smith’s ‘Green Go’ dragster with a 7.57s at 173.32mph followed by Mark Gapp’s ’41 Willys, which ran a 7.78s at 162.70mph. Finals came down to the two of them, and Mark must have seen Kendall red-light his 7.65-second pass, as he cruised to the win with a lazy 9.26-second quarter. The Bates guys were getting a handle on the Vauxhall’s new engine combo, and long burnouts followed by wheels-up launches make for an exciting car to watch. Another exciting watch is Sue Gray’s ‘Mad Cow’ machine. She refuses to put wheelie bars on, which is good for photographers and the crowd! Modified was won by Bruce Riddick, who also took away the award for Best Appearing Crew and Car. Gary Sinkinson’s tough, wheel-standing El Camino is something car to watch! Running a best of 10.55s at 124.03mph on the day with a methanol injected 427ci small block, you just wait till he hits the nitrous! John Shepherd sure has his hands full trying to tame his front-engined dragster! A big congratulations must also go to Zach Sayer, who has finally found the nine-second zone after working hard over the winter months, with a 9.85s at 136.74mph. Remember, Zach is in a wheelchair and uses hand controls to get down the strip. 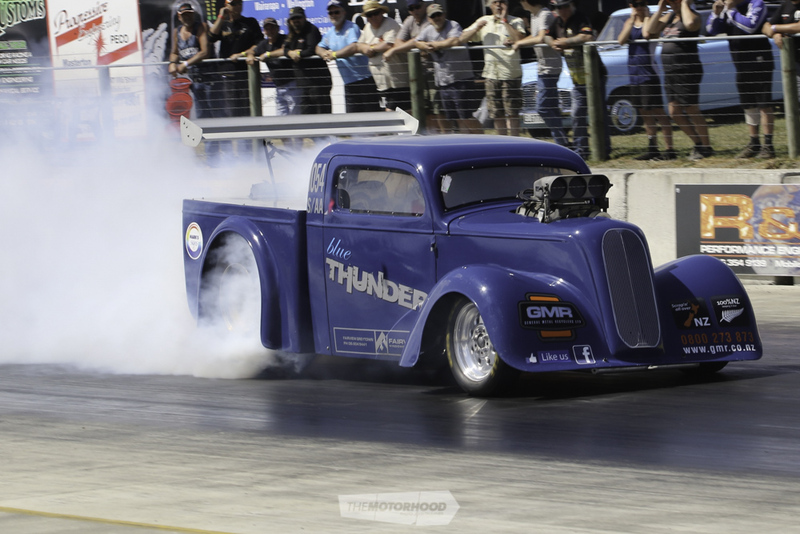 The next competition meeting at Masterton Motorplex will be the Dragstalgia and Masterton Motorplex 20th Anniversary event, on the weekend of January 6–7.